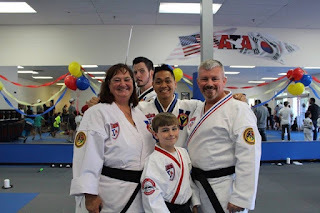 You’ve seen the earlier posts: just about four years ago Paul began his journey to earn a Black Belt. Within a month, I joined him on the mat and a month or so later, Stephanie joined us both. Paul’s journey became a family journey. Here’s what’s happened since my last post (over two years ago, please forgive me!) when we passed our Blue Belt tests. 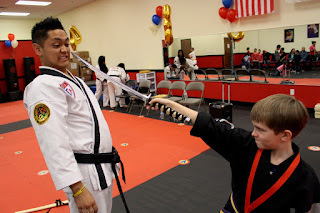 This past June we all passed our tests for our First Degree Black Belts! Like all of life, the challenge of testing didn’t come without a few hiccups, but in the end we celebrated as a family. Right on track with his goals, last year Paul competed for a full year to include at the ATA Spring Nationals 2017, became the 2017 Nevada State Champion (Color Belt, 9-10 year old boys), and was the Silver Medalist at the ATA 2017 Districts Tournament (Nevada, Arizona and California). And suddenly it was time for Black Belt testing! We all tested on the same day. Paul went first and we cheered for him, then Steph and I tested together with the adults and Paul cheered for us. We felt it was the perfect culmination of a three year journey. After working so hard to test for each belt, we faced the toughest test yet. All the work that led to that point was to allow us to take the toughest test so far rather than to just be awarded the belt. In spite of all the prep, a 10 session set of dedicated classes for the folks testing for their decided rank, when the day came, we were all confident but nervous, and the test seemed harder than it probably was. 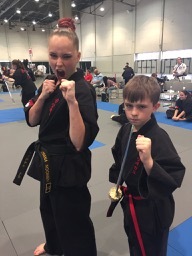 It was also definitely more exciting as the head of Victory Martial Arts nation-wide sat in front of us and judged our performance as it related to the standards. When it was all over, we had passed. We celebrated the end of the beginning that evening in a candlelight ceremony where we we shared in the significance of the Black Belt, and entered into the small community of those who’ve earned the privilege of wearing one. And we celebrated the opportunity to look forward to the beginning of a new journey. 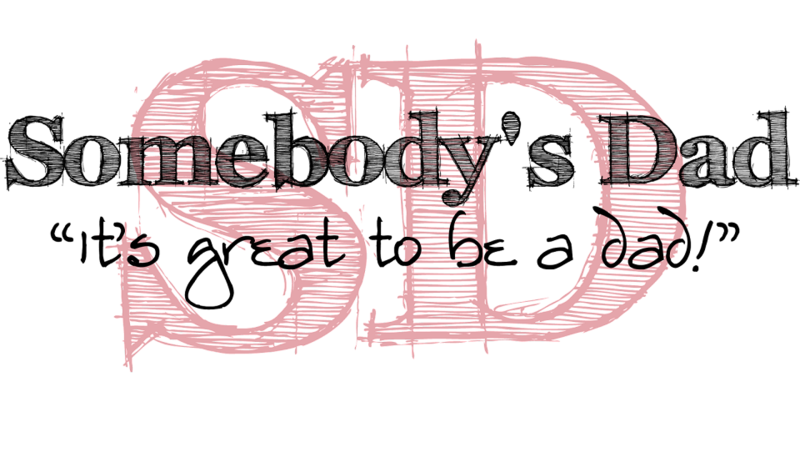 As I’ve been told and read in the context of the Black Belt across several martial arts styles, the Black Belt represents the mastery…of the basics. I think it’s true. After all the work, memorization, struggles, nerves, failures, injuries, and incredible successes, it’s at that time you realize just how little you really know or are truly proficient at. And so we found ourselves at the beginning of a journey once again—now to begin to hone the body as a weapon, to move beyond the basics. Learning the basics was difficult. Building on that foundation is more difficult, but we’re on to learning the 1st Degree Black Belt form called Shim Jun. With 81 moves and more difficult techniques, it’s the longest, most complex and challenging form we’ve had to learn so far. Make no mistake though: it’s fun! Paul and I have also learned the traditional Black Belt sword form called Gumdo, associated with the Korean equivalent of the well-recognized Japanese katana. With the sword as his weapon, now he has to perform this traditional form each time he competes in order for his XMA sword form to count for points. While Gumdo is relatively short, it’s a highly technical form. It’s performed very deliberately and slowly compared to most other weapons forms, making even the smallest mistakes very apparent. The precision and accuracy required to do the form well is a very real challenge. 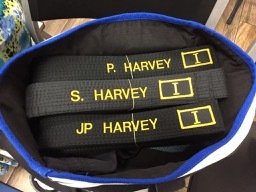 For Paul, we couldn’t be prouder: the competition in his ring as a new Black Belt this year has been amazing. 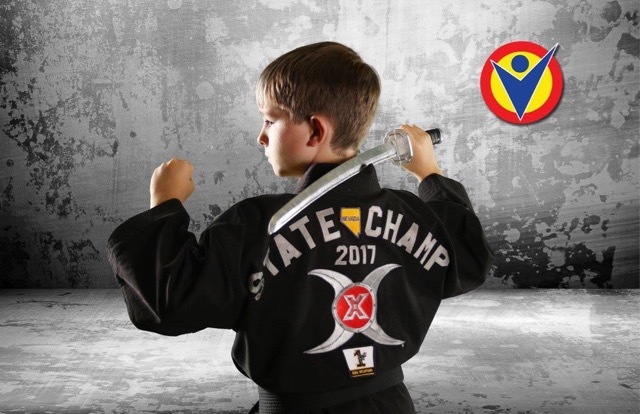 These kids are all incredible martial artists who bring their A-Game every single tournament. Each one of these young athletes has my respect for being a part of the circle of friends that continue to motivate my son to always do his best. Because of the time it took to learn these new forms, he didn’t have a shot at making State Champion this year, but he’ll finish in the top 10 and qualify to compete at the District Championships! First, Mr. Guerrero, our Chief Instructor. He has been Paul’s instructor from his first day Paul started as a White Belt. He’s also the gentleman responsible for challenging Paul to start competing several years ago during a slump in his journey to Black Belt. Mr. Guerrero has continued to instruct, mentor, correct, encourage and champion Paul’s efforts. Without you, sir, I don’t know how this journey would have happened. We’re a part of your Victory Summerlin family, but you’re definitely a part of our family too. I can’t imagine our experience, and especially Paul’s, could have been any better without you. Second, Miss Noonen, who came alongside us this past year and has changed the way Paul approaches how he performs XMA. She’s been a picture of honesty and grace, and taken time out of her schedule to teach and coach Paul specifically in the context of competition with a sword. Ma’am, your timing was perfect as Paul moved into the significant challenge of competition as a Black Belt. I can’t imagine anyone else who could come alongside our regular instructor and form such a perfect team to move Paul forward in his journey. You both encourage, inspire and compel our son to exceed his own expectations, to set new and high goals, and then to realize they’re achievable. And both of you have warmed his heart with a phone call, a hug, or a hero shot during those times when the goal isn’t met. We can’t thank you both enough. One final thought: How many parents get to legitimately tell their kids to go play with a sword? We are those lucky parents!